"Electrolux Professional and All Japan Chefs Association"
A workshop hosted by Daniel Schneider, Electrolux Professional Application chef and Chef Sammy Iwasaki, Worldchefs’ Chef2Chef ambassador in Japan held in Tokyo. 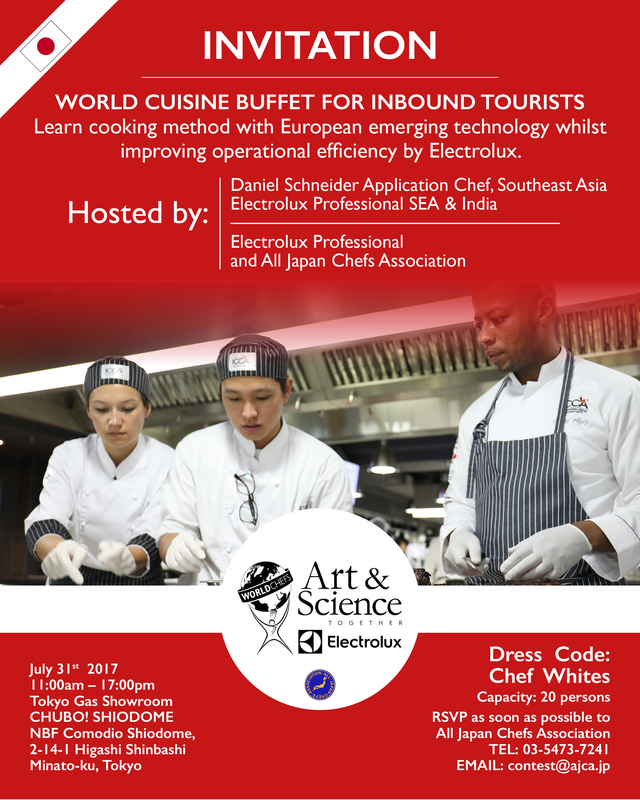 Electrolux Professional and WORLDCHEFS are pleased to invite you to the Chef2Chef training seminar in 2017, the first time in Tokyo, as a part of their “Art & Science Come Together” alliance. This workshop will educate chefs on implementing sustainable practices in the kitchen while maintaining high standards. The chefs will serve quality food, balancing a mix of Electrolux innovative solutions and the chefs’ creativity. The workshop will focus on the preparation of different types of buffet menus of Japanese/Asian/Western cuisine. We will showcase different ways of using new technology such as vacuum cooking, cook chill system and pressing cooking to give a perfect result in cooking 19 dishes. This innovative approach also improves chefs’ daily activities, food cost and food waste. The aim of the workshop is to build on, and extend the range of skills, techniques and knowledge of hotel and restaurant operations previously acquired. This session aims to build on current technical practices and create new culinary knowledge, skills, and techniques such as vacuum cooking, cook chill system, and pressing cooking in different ways to enhance the productivity and consistency.